To make golabki, heat oven to 350 degrees. Remove the core from the head of cabbage and place it in a pot of boiling, salted water. Cover and cook 3 minutes, or until softened enough to pull off individual leaves. Meanwhile, saute chopped onion in butter until translucent. Let cool. As the cabbage leaves loosen, remove them and drain in a colander. You will need 18 leaves for this recipe which serves 6. Chop remaining leaves coarsely and place them in the bottom of a casserole dish or Dutch oven. When the leaves in the colander are cool enough to handle, use a paring knife to remove the tough stem from each of the 18 leaves without cutting through the leaf. Mix cooled onions with beef, pork, rice, garlic, salt and black pepper until well combined. Don't overmix or the meat will become tough. Place a 1/2-cup log of meat at the bottom edge of each cabbage leaf. Enclose the meat in the cabbage leaf. Flip the bottom edge of the cabbage leaf up and over the meat, encasing it completely. Make a neat packet. Then roll! Flip first the right edge of the cabbage leaf toward the center and then the left until you have a packet that resembles an envelope. Then roll the cabbage packet away from you until you have a tubular shape, like an eggroll or burrito. Place in casserole dish or Dutch oven. Layer the cabbage rolls in a casserole dish or Dutch oven on top of the chopped cabbage, seasoning each layer with salt and pepper. Pour beef stock or tomato sauce over the cabbage rolls in the casserole dish to help the steaming process as the dish cooks. Bake for 1 hour. Enjoy cabbage rolls hot from the oven. 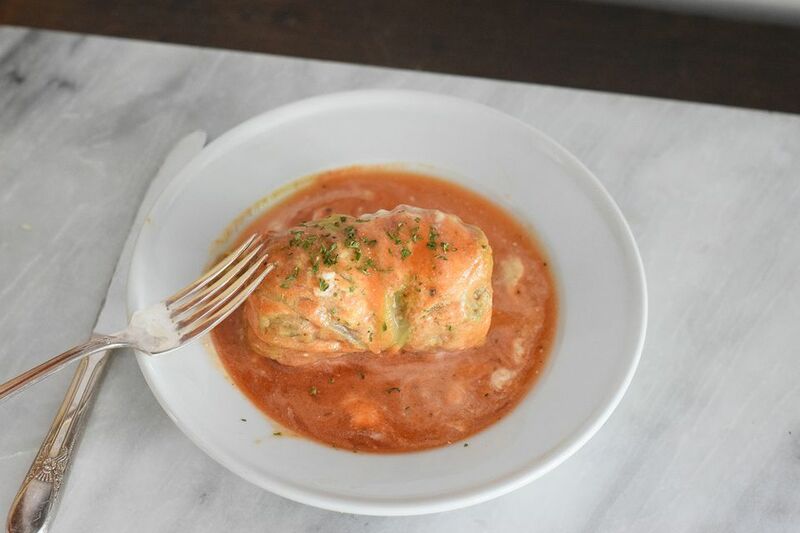 Serve with pan juices and a drizzle of sour cream, or thicken the pan juices with sour cream and pour the sauce over the plated cabbage rolls. Here is the recipe in its entirety.